In recent months, a TvZ build used by the literally (but not figuratively) big-headed sSak has been the talk of the Korean community in strategy discussions. It is the so-called 1-1-1 build, which involves raising the barracks, factory, and starport in quick succession. However, this build is always referred to as the "sSak-style 1-1-1". The 1-1-1 is usually considered a gamble, but the so-called sSak-style 1-1-1 is said to be difficult to stop even when you know that it is coming. It has been so successful that sSak, who has frequently been the target of sometimes playful and sometimes impolite mockery by the Afreecan hoi polloi in the past, is now at times reverently referred to as a 1-1-1 meister. No one knows how long this mood will last, but we can be sure of the fact that something is different about how sSak uses this build. At the heart of this mystery is the man, the legend, the bonjwa: The great iloveoov. After hearing trOt, formerly of SK Telecom T1 and who is hilariously known as "the guy on the left" (of KCM) due to his obscurity, mention the oov connection during the KCM Legend Matches, we contacted him to get more information. This is that untold story: The Old Man and the Build. At the height of his dominance, iloveoov was downright unbeatable. Not only did he almost never lose, but he frequently won by dominating rather than by the skin of his teeth. His incredible macro almost seemed as if it were the result of typing "show me the money" and "operation cwal". For this, he was sometimes called the Cheater Terran. Unfortunately, iloveoov's career was relatively short-lived for someone so great. Eventually, health issues would force him to the sidelines. By 2009, he was officially a playing coach for SKT T1. While he was still eligible to play in Proleague, he had transitioned smoothly to the role of a coach developing the next generation of players. On February 16th of 2009, SKT T1 faced off against the Woongjin Stars. The Stars sent out our friend ZerO (check out his interview with TL here), who promptly dispatched Best and Fantasy, two-thirds of T1's vaunted Do-Taek-Myung (Best-Bisu-Fantasy) triumvirate. Coach Park decided that a dramatic move was needed to fire up the team and sent out the now ancient and hobbled iloveoov on Sin Chupung-Ryeong. This ended up being one of the last Proleague matches oov would ever play. For anyone else in oov's condition, the game would have been considered a mismatch. With his ability to smoothly manage all game situations and play a winning macro game, ZerO was the heir apparent to GGPlay's style. On the other hand, iloveoov had become an old man, which was and remains brutal in a sport where youthful reflexes mean so much. But oov was not any old man. He was now known as "the build-crafting old man", which is a reference to an essay familiar to most Korean high school students titled "The Club-crafting Old Man". Both in medieval times and for a long period after the Korean War, it was not uncommon for Korean housewives to iron wrinkles out of clothes by softly banging them with short wooden clubs. In the essay, the author asks an old craftsman to make him one of these clubs. The author is annoyed by the crankiness of the old man, who takes his sweet time in shaving a piece of wood to make what is seemingly the simplest of objects. He later repents when his wife heaps praises upon the myriad of little ways in which the old man's handiwork is perfect for her tasks. The essay is at once a homage to master craftsmanship as well as the wisdom of all that is old, including things, people, and traditions. Old man oov had been at work carefully sculpting a TvZ build and sanding off its imperfections one by one. He took his role as developmental coach very seriously. sSak was one of the young second-team players he took under his wing at this time. It was then that sSak was taught the ideas behind this build under the bonjwa's tutelage. To quote trOt, sSak was one of the bonjwa's sons during this period. Now, at a moment of crisis for T1, the old man (not his young protege) was called upon to work his magic one last time on one of the strongest Zergs in Proleague. The result was both unexpected and delightful. The old man prevailed in dramatic fashion against the rising young buck with the power of his imagination. Liquipedia identifies the build used in that game as "iloveoov Fake Mech". It does a great job of describing the build, but here is how trOt elaborated further on iloveoov's overarching vision and concepts as they were explained by the old man himself to T1's young prospects. At the lowest resolution view of the game, the major tension in the early part of the game is between three goals: economy, safety, and tech. The standard bio-play openings focus on economy and safety by expanding immediately after the barracks goes up while constantly producing marines. In turn, the factory is delayed until both the natural expansion and multiple barracks are in place. Building the factory too early after expanding exposes the Terran player to two broad categories of vulnerabilities. One, the zerg will have devastating timing attacks that can kill or maim the Terran player before he can make enough units to defend well. Two, the zerg will be free to safely secure the third gas-mining base and make many drones before the Terran can make enough units to threaten it. So when the Terran player is producing marines from multiple barracks prior to making a factory, good marine-medic micro control will have a significant impact on how well he can transition to the late game with an advantage. It turns out that marine-medic micro versus mutalisks is not so easy. Surprise! StarCraft is hard. What we have heard from ZerO in the past is that perfect marine-medic micro is a little better than perfect mutalisk micro but good mutalisk micro is a little better than good marine-medic micro. One of the more salient explanations given for why Zergs have managed to survive and periodically thrive against Terran in the post-KeSPA era despite the inherent advantages that Terran enjoys versus Zerg on the most played maps is that the Terran players' marine-medic micro has declined more than the Zerg players' mutalisk micro has. Indeed, the popularity of the so-called +1 5-rax build in the TvZ meta-game is a sign of this disparity in the degradation of micro abilities. The idea of building 5 barracks instead of 4 barracks is to compensate for less micro (and fewer turrets) by producing more marines. The pros did not realize this immediately. Not so long ago, streamers on Afreeca would have claimed that +1 4-rax was preferable to +1 5-rax because it offers a faster path to the late-game mech transition that makes Zerg players quake in their boots or smash their keyboards in frustration. However, the pros make their living with this game because they figure these things out quickly and they certainly did. 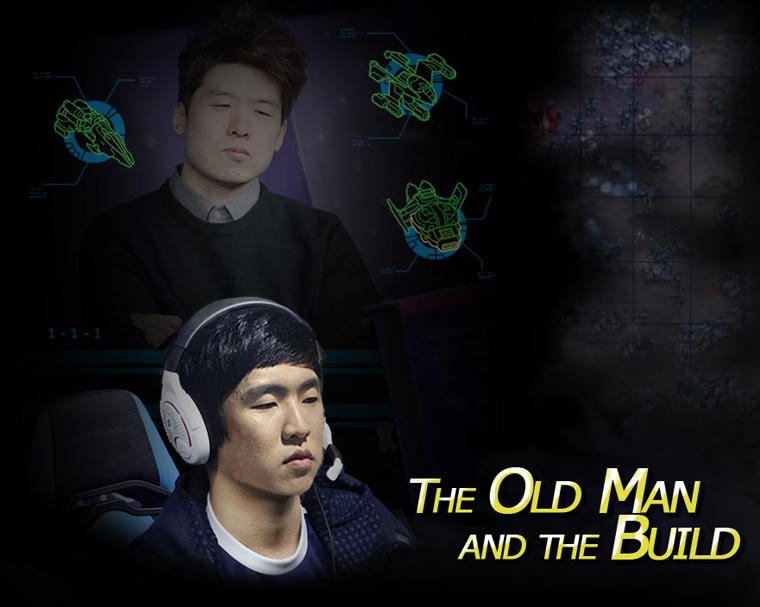 The old man recognized that while the best Terran players did not need much help, he could greatly contribute to the fighting strength of his team by developing a style of play that could cover up the weaker Terran players' deficiencies in TvZ. Could he do so without upsetting the delicate balance between the competing objectives of economy, safety, and tech? The Terran player makes the factory early (refinery @11~12 pop. count) and produces a vulture (and perhaps a second vulture) as soon as possible. The starport is made as soon as the factory is completed and a wraith is produced as soon as possible. Tech is very fast in this build. Safety is achieved through the vulture and wraith. The vulture can handle large numbers of lings in the open until ling speed is researched. Furthermore, a few mines can be used to suppress hydra aggression. The wraith works in concert with the mines by preventing overlords from moving out into the open early. In the mind of the Old Man, this little idea was the glue that would hold the build together. Economic equalization is achieved by making the Zerg spend fewer minerals on drones. The presence of a vulture threatens a runby into the main. Zerg will be forced to make a sunken colony at the natural. The wraith will snipe one overlord (and likely a few more). If the vulture successfully enters the main to snipe some drones and/or the wraith kills more than one overlord, then the Terran can feel very happy but such early game achievements are not necessary. At this point, Terran will have enough minerals to take his own natural expansion, which concludes the first phase. Throughout this process, it is essential that both the vulture and wraith are kept alive. The vulture plants itself near the entrance to Zerg's natural base to suppress zergling aggression. The wraith should constantly move in and out of the Zerg base to scout both unit composition and tech. The Terran player sets up production facilities for a powerful mid-game timing push. Zerg would have most likely cleared the small number of mines near its base by this point. The terran composition can vary depending on scouting information. In the original version of this build, iloveoov planned to counter mutalisks with valkyries. However, in the refined version of the build that is common today, the preferred way to deal with mutalisks is the irradiation spell. Valkyries are more situational. They can be used aggressively, but that could be risky. Is such a risk necessary when vessel tech will be very fast? If used purely for defense, then valkyries will delay the vessels that are needed for the timing push. Will the mutalisk timing require valkyries given that mana takes time to accumulate? It depends but the scouting wraith will answer these questions. Furthermore, when the initial wraith scouts the timing of mutalisks, the Terran player is very happy to liberally apply turrets all over his base. These days, setting up 4 barracks to build a marine-medic force while making vessels and tanks is the most common variation. At some point, Terran may lose its scouting wraith to scourge, but it will have more than accomplished its job by that point. With irradiate tech being so fast and turret timing being perfect, Terran will not have to fear mutalisk raids when enough tanks are out for the timing push. This begins when the terran marine-medic-tank-vessel force moves out toward the Zerg. At the same time, Terran takes a third base. Taking an extra base in concert with a timing push is a familiar pattern for most players. Today, Terran will likely also make the transition to mech at this point. If he has reached this point without falling behind too much, then he can smile knowing that he can continue the game in a way that minimizes his personal weaknesses. The way it was conceived, oov's 1-1-1 was not meant to be a strategically risky build. One might say that it is mechanically risky since it burdens the user with more multitasking and vulture micro in the opening stages. However, when marine-medic micro (versus mutalisks) is replaced by patrol micro (versus zerglings) with one or two vultures, players with skill sets more suited for the latter may actually find the trade-off more than worthwhile. One could also, if one so wished, take strategic risks at any time by being aggressive with valkyries, forcing vulture runbys, or using dropships, but such risk-taking variations should be viewed as levers of the metagame that avail themselves in this build. Through the pulling of such levers, oov's 1-1-1 can legitimately be called the build of a thousand variations. At the time that oov conceived this build, zergs made more zerglings early than they do today. This meant that zerg would have more map control since there are not enough marines that early in the game to safely roam the map without being surrounded or backstabbed at home. In contrast, a single vulture can safely roam the map without such risks early in the game provided that the terran player's micro and multitasking are on point. The high-level players among the readership of TL are likely familiar with many of these ideas. However, most of us mortals can only stand in awe of the Old Man's build-crafting genius, which took into account not only the metagame and strategic ideas, but also the specific skill sets of the players who might use them. Of course, oov's (and now sSak's) 1-1-1 is not as simple as this article makes it out to be. Using the information gained by scouting with the wraith in the right way is a pretty high level decision problem. There are matters of judgment on exactly how much to invest in defense and when. Walking this tightrope efficiently is the art that is in the details of this build. What sSak uses today to great effect is not so much the build order but the encyclopedia of macro-level responses to various situations that he was trained to handle by iloveoov. Sometimes, the user will fall off the tightrope while multitasking and into the jaws of the zerg. However, when it is used well, the 1-1-1 is a thing of beauty that shows off the possibilities of StarCraft as an art form. Extra tidbits: sSak's habit of playing games while drunk has also earned him the nickname Chwi Ho-seon. Chwi means drunk. Choi Ho-seon is his government name. Special thanks to trOt for contributing the main substance of this article. Oov's mind has the builds. do they go valk in this build? or is it simply scout the timing of muta with wraith, then build turrets, and get SV asap? interesting. Wraith-mine openers will always have a special place in my heart. Back when I was playing in 2001~2002 one guy in our group of friends showed up with the build one day (I'm sure a ton of other ppl developed it independently as well) and we all thought it was most clever thing in the world. When it showed up years later as a build in top level progaming, I couldn't help but shake my head and smile. It was a such a cool reminder that even though there's a huge skill gap between the average player an a progamer, that at the heart of it, we're all still playing the same game. Great post! I've been seeing it done more and more lately but was not aware that sSak was the source of the build's renewed popularity, I'll have to check out his stream sometime soon. Builds like that were why I fell in love with Proleague, you never knew when you would see something unexpected and amazing happen. Great read. Great write-up, i liked it. I also used and liked the build a lot, but messed up the opening often. I see the build more often now. Although I've seen Flash has been doing a 1 factory FE variation of the concept: rax > factory > cc > starport for better economy. Light has a really good write up of what to look out for and how to use the build. Great article! I have been thinking about this build and it reminds me of the sair style of toss openings. I thought this was the qikz build! Look here guys ~ isn't 1-1-1 ? ^ That game is extremely entertaining, must watch imo!